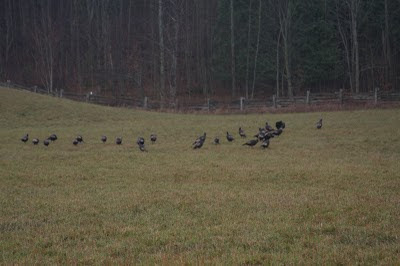 Without meaning to, we have become proud owners of a large flock of wild turkeys. It began last fall when they wandered into the front field. At the time, we thought they were simply passing through. Then they discovered the feeders. I have several feeders out for squirrels, chipmunks, deer - and the feathered folk too. I suppose it was simply natural that the turkeys would choose to move in. They took up residence in the forest, and while turkey's may have wings they are not excellent at roosting. It's quite a frightening sound to hear them crashing through the branches at two am. We began with about 12 turkeys, and somewhere over the winter that number seems to have doubled. Today they were wandering in the back pasture, oblivious to the dogs barking up a frenzy at these "intruders". So I did what any farm girl would do, I put out more chicken scratch for them. I need them to stick around until Thanksgiving!